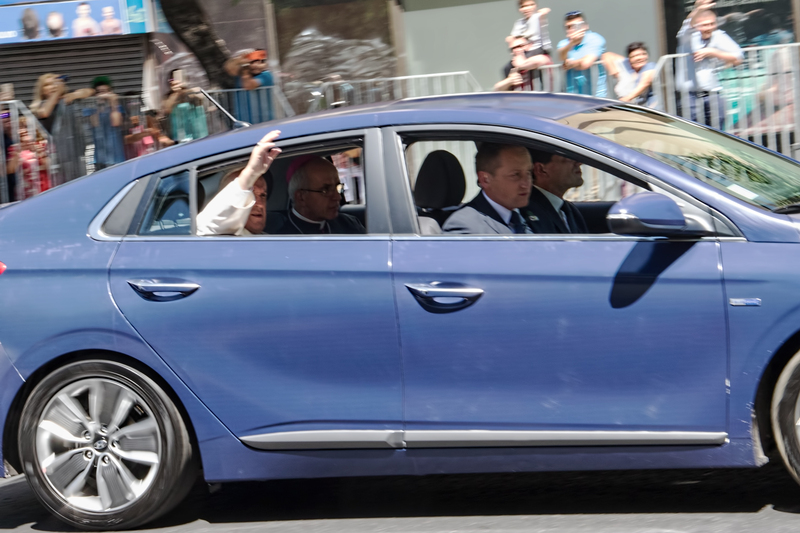 The arm in the white sleeve belongs to El Papa Francisco, the man causing all those closings and traffic jams in Santiago this week -- you can just see his face behind his arm. It's not a very good picture, but I almost missed getting it at all, because after the cordon of motorcycles roared down the avenue, following by a few white SUV's, I was expecting the Pope to be in a car that was a little bigger and a lot less beat up. I didn't realize he was in the little blue car until he was almost past me. And I was only on the Avenida Providencia at all because I'd taken a wrong turn and gotten myself lost on the way back to my hotel. I'd stopped for lunch at one of the shops in the mall at the Costanera Center (I'd guessed they might be open despite the Pope-a-thon, and I was right) and I walked out a different entrance than the one I'd entered by, and started walking the wrong way down the Avenida, away from my hotel rather than towards it. By the time I noticed that nothing looked familiar and realized that I was going the wrong way, the police were putting up barriers, traffic was stopped, and it was no longer possible to get to the other side of the street. So I parked myself in front of one of the barriers and waited, and after an hour of standing in the hot sun and acquiring a very sunburned nose, I glimpsed the Pope for a couple of seconds. Hola? Hola? Is this thing on?